Gimme Shelter is a 1982 O’day, and she still has her original mainsail. Yes, our main is 33 years old and so baggy that you could probably cut a storm jib out of it, re-stitch, and never even notice the material was gone. Unfortunately there is no cheap way to replace a sail. Sure, you can scour eBay and resale shops for used sails approximately the same size that might be in slightly better condition, but you’re still going to spend several hundred dollars and wind up in the same boat as you were before (both literally and metaphorically). Yes, we heard tales of both a strong track being mis-measured by one company and a sail cover being mis-measured by another company. Both companies fixed the issues, but on the sail cover you can definitely see where it originally ended, then they stitched on another 18″ of fabric to make it reach the end of the boom. Construction: Designed using Quantum’s, iQ suite of computational tools, constructed from Charter 7.0 CC woven polyester. Cross Cut panels are laser cut, and assembled with oversized, tear drop shaped corner and reef patches, wide seams with triple throw stitching, extra layering and extensive reinforcement of high load areas throughout, with multiple webbing straps, stainless steel rings or Rutgerson press rings at head, tack, clew and reefs. We’d like to thank you for the opportunity to build a new mainsail for your O’Day 34. Our Cruisemate Plus would be great performing sail for your boat. Your sail would be constructed from Dimension Polyant’s OC, CB or AP cloth. This is a superior woven Dacron material that surpasses the longevity and performance of other cloth manufactures. The biggest difference between them is that the AP has more of a UV inhibitor (like sunscreen) to help it last longer, a slightly tighter weave and the highest quality yarns available on the Market. Dimension’s QA procedures grade their yarns in 3 categories (A, B & C). ‘A’ yarns are used in the warp and fill of the AP cloth. Our prices also include custom measurement and design to provide a guaranteed fit to your boat. Additionally, unlike other lofts, you would be welcome to stop by during construction and see your sails being put together. Also, if you have any specific thoughts about the design of your sails you can talk/visit with Trent, our designer, to have input on the sail design to get the exact performance that you desire. 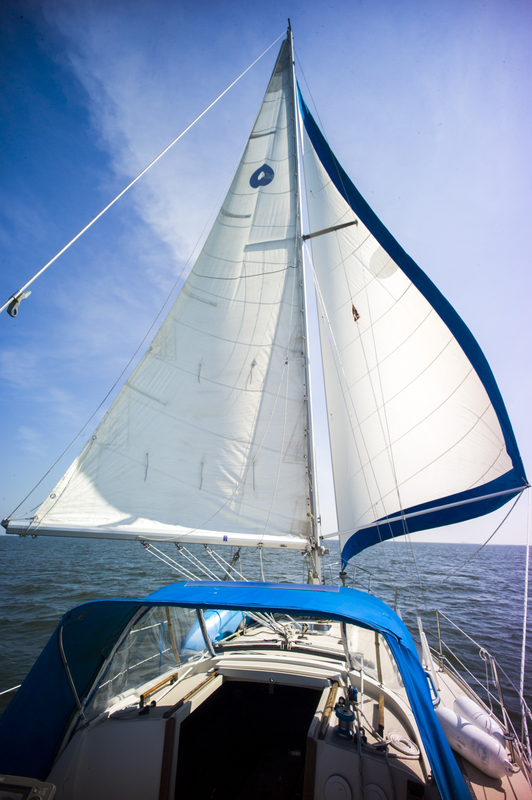 Also removal/disposal of your old sails and installation of your new ones are included as well. We are the only loft in the area doing 100% of the work right here in Kemah! Note: The Hyde website has a huge database of vessels, and you can just choose your boat model and then spend hours selecting fabrics and adding all the bells and whistles to your sail. The breakout below was the the Cruising Mainsail (Challenge Hi Modulus Dacron) option with full battens. Then there was the Do-It-Yourself option. We also got a quote from SailRite for a mainsail kit. Obviously the big catch to this option is that Mary would have to sew it together, which means purchasing a much heavier duty sewing machine. I’m not going to make her assemble her own Christmas present, but it is worth noting that if you wanted to make your own sails, the cost of the mainsail kit and a SailRite sewing machine is about the same as having your sails made by a local loft — but when you’re finished you still have a SailRite machine for the rest of your projects. As you can see, the difference in price between our local lofts is negligible, $2037 – $2,230. Yes, Banks came in highest, but they bid 4 full battens while the others bid 1 full, 3 leech battens. All of them offer a 1 year warranty on their sails. However, the mail-order sails do create significant savings — they’re almost as cheap as a SailRite kit. The scary part with the overseas sail lofts is that if it doesn’t fit correctly, I could be looking at hundreds of dollars spent and weeks of waiting to ship it back to them for alterations. On the other hand, if the mail-order sails do fit, we’d have enough money left over for solar panels or a nice chunk of change to put towards upgrading the autopilot. Is it worth the gamble? I’m continuing my research. I have to decide by Friday if I want 4 full battens, 2 full battens and 2 leech battens, or 1 full batten and 3 leech battens. Then I have to pick a sail loft and pull the trigger. We started to price out a new headsail, but decided to hold off for another year. It’s such a big investment. I was toying with the idea of sewing it myself as we already have a Sailrite machine. Not sure what we’ll end up doing. Will be curious to see what you decide. Got a new main for my Pearson 26 made in 2014. I went with our local sail loft and walked into Bill’s shop to discuss aspects of the sails and its benefits. 2 seasons later, very glad I went local. On his computer, Bill was able to show me different sail configurations and their performance characteristics in different wind conditions and points of sail. I’ve tried to do the math before, and this program stunned me! We discussed fully battened sails, the number reef points (I wanted 3 but he assured me I won’t be offshore with this boat). Bill, as a sailmaker and great racer in his own right, was incredibly knowledgable and the ability to talk to him about aspects of the rig was worth the extra cost alone. Bill came out and measured my boat himself. Measurements on your boat can vary significantly over 30 years as equipment changes. Buying local is often worth the price just to establish contacts with other very knowledgable sailors. A sail for Christmas? Really?? You NEED a sail. You don’t NEED a Sailrite sewing machine. Mary enjoys sewing. Buy the woman a Sailrite sewing machine. She will love it!! We actually are having 10% discount that makes the Banks sail cheaper than Quantum. Also it’s the ONLY non overseas sail in your quotes. The Quantum sail comes from Durtek sails in Sri Lanka. If you want partial battens that reduces our price. There are some other things I’d like a chance to discuss with you before you make your decision. If you’d like please contact me via email or call the shop. Hyde Sails Direct guarantees the sail will fit perfectly. Through our network of local US lofts, we can handle any needed alterations. We don’t ship it back to our production loft in the Philippines. Our guarantee: You are 100% happy or return it within 30 days for a 100% refund. Thank you for including HydeSailsDirect.com in your review. Hyde Sails International is a global company, with one of the world’s largest, well-established production loft. For over 50 years in Europe and Asia, the Hyde Sails brand has been synonymous with quality. Hyde Sails Direct partners with Hyde Sails International, but we operate as a separate entity. Our mission is to deliver Hyde’s renowned quality at internet prices. We offer a 100% money back guarantee – we will either repair the sail to meet your expectations or we will take it back and refund 100% of your price. If any minor alterations are necessary, our network of affiliated lofts in the USA will do the work promptly. If a major mistake in measurements was made, we will simply send you another sail, and let you use the first one while you wait. We define major mistakes as those that require cutting across a seam, or adding a panel. We’d rather start from scratch and do it right the second time, with our sincere apologies for the inconvenience it may have caused you. We make sure you are 100% happy with your new sail. We don’t lose money on our 100% money back guarantee. We recoup the cost by selling the mis-sized sail as a slightly used demo. We just have to do the work twice to ensure our customer is happy. In the five years since we went online, we have earned an A+ rating from the Better Business Bureau. We stand behind our products, before and after the sails are delivered. I would consider the importance of the main sail to justify paying for quality and the duration that the sail will be in use to “amortize” the cost so that buying the best sail is justified. And since I’m not an experienced importer, I would buy local so I could deal more easily with my vendor.